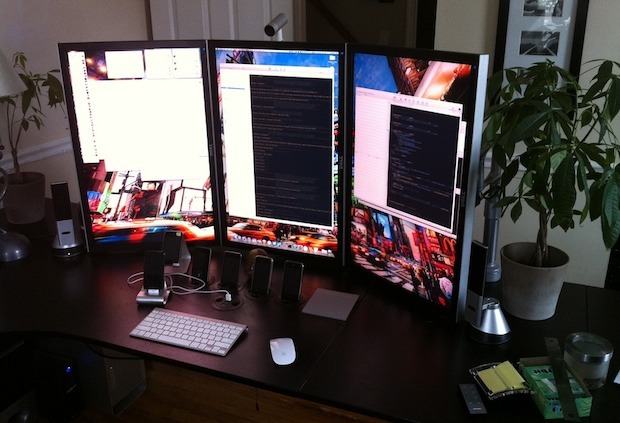 What an awesome Mac setup this is… connected to those three 30″ vertically oriented displays is a Mac Pro under that desk. I’m going to assume this is an iOS developer considering there are code editors open on screen, not to mention the six iPhones under all the displays. If you’re wondering, rotating a Macs screen orientation is just a matter of holding down Command+Option when you open the Displays panel in System Preferences, but if your monitors don’t have a way to stand sideways that won’t do you much good (you can do this with the MacBook Pro & Air lineup too and just rest it on it’s side if you really want to). Love the recessed iphone docks in the desk. Must have every version of the iphone / ipod.